RFID technology is being implemented in a number of industries. Supply chain implementation is perhaps one of the most frequently mentioned applications of RFID tags and equipment. Retailers such as “Wal-Mart” and grocery stores such as “Albertson’s” have begun to make it mandatory for their suppliers to tag merchandise destined for their stores. 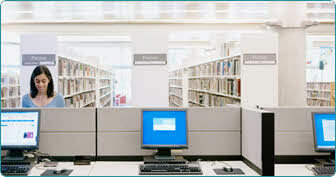 There is, however, a key difference to the library’s inventory as compared to that of a warehouse or a retail outlet. In the warehouse and retail supply chain, goods come in and leave. Only occasionally are they returned. The retail sector is looking at RFID as a "throw away" technology that hands an item to a customer which gets discarded. Yet the item wise unit cost of including an RFID tag is much more than the cost of printing a barcode on a package. In libraries, items are taken out and returned many times. Thus the same RFID tag is re-used many times. RFID tags replace both the EM security strips and Barcode. Simplify patron self check-out / check-in. Ability to handle material without exception for video and audio tapes. Radio Frequency anti-theft detection is innovative and safe. High-speed inventory and identify items which are out of proper order. RFID (Radio Frequency Identification) is the latest technology to be used in library theft detection systems. Unlike EM (Electro-Mechanical) and RF (Radio Frequency) systems, which have been used in libraries for decades, RFID-based systems move beyond security to become tracking systems that combine security with more efficient tracking of materials throughout the library, including easier and faster charge and discharge, inventorying and material handling. RFID is a combination of radio-frequency-based technology and microchip technology. The information contained on microchips in the tags affixed to library materials is read using radio frequency technology regardless of item orientation or alignment (i.e., the technology does not require line-of-sight or a fixed plane to read tags as do traditional theft detection systems) and distance from the item is not a critical factor except in the case of extra-wide exit gates. The corridors at the building exit(s) can be as wide as four feet because the tags can be read at a distance of up to two feet by each of two parallel exit sensors. The targets used in RFID systems can replace both EM or RF theft detection targets and barcodes. Rapid check-out / check-in The use of RFID reduces the amount of time required to perform circulation operations. The most significant time savings are attributable to the facts that information can be read from RFID tags much faster than from barcodes and that several items in a stalk can be read at the same time. While initially unreliable, the anti-collision algorithm that allows an entire stalk to be check-out or check-in now appears to be working well. The other time savings realized by circulation staff are modest unless the RFID tags replace both the EM security strips or RF tags of older theft detection systems and the barcodes of the library management system - i.e., the system is a comprehensive RFID system that combines RFID security and the tracking of materials throughout the library; or it is a hybrid system that uses EM for security and RFID for tracking, but handles both simultaneously with a single piece of equipment. There can be as much as a 50 percent increase in throughput. The time savings are less for check-out than for check-in because the time required for check-out usually is extended by social interaction with patrons. The readers are highly reliable. 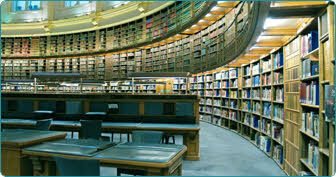 RFID library systems claim an almost 100 percent detection rate using RFID tags. There is no false alarm than with older technologies once an RFID system is properly tuned. RFID systems encode the circulation status on the RFID tag. This is done by designating a bit as the "theft" (EAS) bit and turning it off at time of check-out and on at time of check-in. If the material that has not been properly check-out is taken past the exit sensors, an immediate alarm is triggered. A unique advantage of RFID systems is their ability to scan books on the shelves without tipping them out or removing them. A hand-held inventory reader can be moved rapidly across a shelf of books to read all of the unique identification information. Using wireless technology, it is possible not only to update the inventory, but also to identify items which are out of proper order. Another application of RFID technology is automated materials handling. This includes conveyer and sorting systems that can move library materials and sort them by category into separate bins or onto separate carts. This significantly reduces the amount of staff time required to ready materials for re-shelving. Finally, RFID tags last longer than barcodes because nothing comes into contact with them. Most RFID vendors claim a minimum of 100,000 transactions before a tag may need to be replaced.